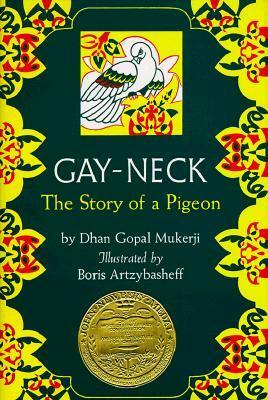 Gayneck: The Story of a Pigeon by Dhan Gopal Mukerji is available at Amazon, Barnes and Noble, and BooksAMillion but don't forget to check with your local library for a copy to read for free. This 1928 Newbery Medal Award winner is dreadfully dull. A note I made to myself during the reading: Maybe the world was so boring back then, without TV and all, that this passed for entertainment? And that statement is similar to my first response to this book as a child (still in single digits); I fell asleep while this story was read to us kids (we didn't read it in one sitting so I actually fell asleep many times and wasn't too concerned about catching up with the story in between reading sessions). The bulk of the story pertains to a bird, a pigeon named Gayneck, being attacked by other birds. The climax comes when Gayneck joins WWI and the birds are replaced by airplanes. There's a boy involved too - we know that he lives in India - but we don't even learn his name and see little about his living conditions. This story has some beautiful descriptions of the sky and the Himalayas but they are scattered few and far between; there's just enough detail about India to hint at the exotic. On the plus side, this is one of the few early Newbery books that isn't highly-offensive to another culture. Dhan Gopal Mukerji was actually born in India before he relocated to the UK and, later, America. The influence of colonialism is (strangely) absent; children unaware of Indian history probably won't notice (if you can keep them awake) but more worldly adults will note the lack of historical detail regarding an old culture (if you can stay awake). Mukerji missed multiple opportunities to teach his readers. We get a vivid description of Gayneck and we learn that pigeons are preyed upon by other birds but we don't get any insight into the actual care of the creatures. We catch glimpses of India but never see the culture. Buddhist monks make a brief appearance but we never learn anything about their religion. WWI explodes across Europe and all we see are airplanes treated like big birds with guns (machine-eagles). We learn nothing about the war or the history of homing pigeons. If you want to know any of this stuff, you have to track down other books to read and there's a pretty good chance those other books will be more interesting.